Both these views equate to a positive outlook. What neither Herbertson nor Larkin takes into account, like the vast majority of pundits in wider political and economic spheres, is that Brexit has not yet taken place. All that has happened so far is that the value of the pound has plummeted relative to global currencies. This has helped boost trade in fine wines old in pounds to Americans, Asians, and Europeans suddenly finding it much more affordable. The UK remains part of the EU for now, however, and we are none the wiser as to what its departure will actually entail. The UK has been the global fine-wine hub for over a century, but what would new, less conducive trading arrangements with the continent mean, and how would the global market absorb such a sea change? Only time—and actual Brexit—will tell. To date, all we know for certain is that fine-wine prices have risen considerably over the past 18 months, from 23 percent for the Wine Lister Tuscany index (comprising Masseto, Ornellaia, Sassicaia, Tignanello, and Solaia) to 53 percent for the Wine Lister Piedmont and California indices (like the Tuscany index, each made up of the top five wine brands from the region, as measured using Wine Lister’s Brand scores) (fig.1). With fine-wine prices experiencing steady growth across the board, rather than being limited to just one region, a market collapse of the like seen in 2011 is much less threatening. Larkin has observed “a wide range of different wines trading from varied origins.” He points out that increasing diversification away from Bordeaux “indicates building liquidity” for other wine regions. “Most of this diversification relates to the hunt for value,” he concludes. This diversification is demonstrated by the number of individual wines traded on the Liv-ex exchange increasing much more rapidly for regions outside Bordeaux (fig.2). Bordeaux wines traded on Liv-ex grew by 71 percent from 2010to 2016, compared to 534 percent for Italy, increasing from 61 individual wines traded in 2010, to 387 in 2016. This is still only 20 percent the number of Bordeaux wines, but the growth is astonishing, and Bordeaux’s piece of the pie is shrinking. Champagne, the Rhône, Burgundy, and the “rest of the world” have also seen the number of wines from each region growing at a rate of knots, between 300and 400 percent. The region whose share grew most over 2016 was Burgundy, which has added 438 individual wines to grow the number traded on Liv-ex by 57percent (fig.2). 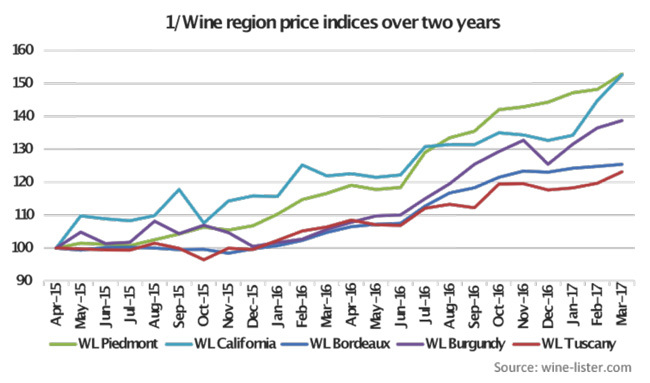 Bordeaux, meanwhile, accounted for 61.6 percent, much lower than its 2016 average of 74.7 percent. This rose to 68.6percent in February, and stayed at 67.0 percent in March, despite lots of noise about the 2014 Bordeaux vintage now that the wines are being delivered, as well as increasing buzz surrounding the new 2016 en primeur vintage. This campaign looks set to rekindle interest in Bordeaux, though it will probably not regain its predominance of 2009 to 2011. For the complete version of Liquid Assets, please refer to Issue 56 of the print magazine.